Eric at Travel Blogs has come up with another innovative way to explore the way we all travel – in reality or in our minds. He asked us to connect up the books and other media that had inspired travel. You can read these, including a slightly unusual source of inspiration for the Pickled Eel here. A related photo here from Mt Nebo looking across the Jordan towards Jericho. I took some photos and video when in Jordan recently. An earlier blog refers to that visit but the video gives a better feel for that place. I loved being able to walk through a place that gave such a sense of historicity yet connection with its inhabitants – all at the same time. There are moments in life that are just laugh out loud crazy. And in this case slightly alarming. 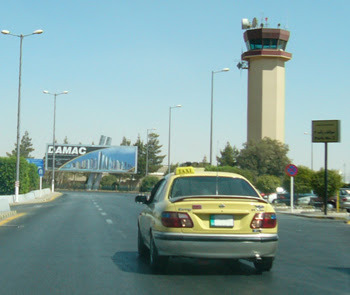 The high speed run from Amman to Queen Alia Airport this afternoon was with a very pleasant and energetic driver who told me he was ten years in the Jordanian Army, retiring as a Captain and for the last ten years he has been Captain of the Taxi. All worked out through broken English and he producing photos of his Army time while we wandered from lane to lane at 120km/h in an old Nissan that was having problems with its transmission at that speed. Both hands off the wheel. Sometimes when conversations falter these drivers put music on. Usually Arabic or sultry Lebanese. But in this case, in mid conversation he popped a tape on and shouted with glee – “back in the Army, scotch (sic) teacher”. At which point martial pipes and drums music blared forth and killed our conversation dead. Now he was just a dangerous driver as he conducted with his right hand and kept time by slapping his knee with his left, occasionally shouting “parade ground” interspersed by a droning hum or a tuneless whistle. As we neared our destination, after marching all over the parade ground in his mind for thirty minutes, the swirl of Amazing Grace came on. He slowed up to tell me how Queen Nor used to love Amazing Grace played by the bagpipes and that once she asked him to make sure it was played at a certain ceremony. The details were lost on me. I told him it was a song about how amazing God’s love is to his people even when we misbehave. He shouted “yes”, turned up the volume and struck his imaginary baton in the air as he hit the gas again. In the end it was only a Hummer at a checkpoint that momentarily quelled the pipes, but as we swung into the terminal Mull of Kintyre was winding up. As he left me kerbside I could hear it blasting from his cab, barely drowning out his tuneless whistle. And his baton was still waving. I hope he got back in one piece. 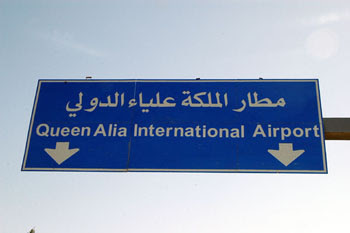 (In Jordan. 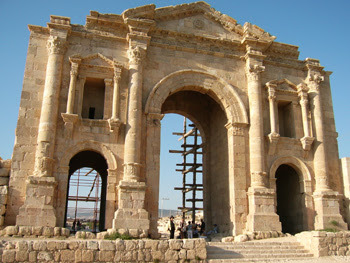 To and from Jerash). Hello, my name is Ishmael. You want to go to Jerash? At this time of the day? OK, no problem, no problem. You want to visit craft store for souvenirs? You have enough souvenirs. OK. No problem. Did you know Ismael was related to Ibrahim in the Bible? It is an ancient name. I live just outside Amman. Look at all this countryside. In 1967 all these market gardens and this little valley was home to a million Palestinians displaced by the war. You want to look at that castle? OK, we are going to Jerash. No problem. Here (in Jerash) are all sorts of things to look at and I will show you where to start and will wait until you finish looking. Please don’t hurry. I am happy to wait. Did you enjoy that? It is a special place isn’t it? I brought my wife up here two months ago just to remind ourselves how special it is. When you live here you can forget. I have nine children. I am very lucky to have all good children. And very lucky that they can all do the things they want without worrying about their future or living like those Palestinians had to in 1967. The peace with Israel was the best thing that has happened to our country. My two eldest daughters have been in university. One studied biology and is now getting a job. The other is in her first year at university. All my other children are in school. The youngest is twelve. Two of my children were twins. Two of my daughters are married and each has two girls. (Laughing) I am a grandfather. It is a good thing and I like it very much. Do you mind if we pull over and buy fruit? Thankyou. Here, you will like these figs I have bought for you. It is Ramadan and I cannot eat until sundown but please, have these figs. Let me wash them first with this bottled water. And please, take this rhumahn (phon: = pomegranate). My wife will be happy with these eggplants and fruit, because all the family get together at Ramadan and they eat a lot. 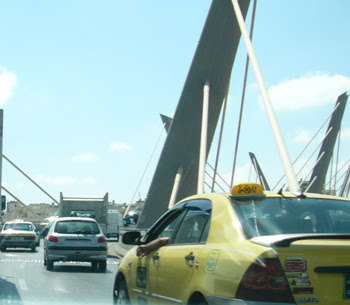 It is cheaper to buy fruit and vegetables on the side of the road than to buy in Amman. Thankyou for your talking. I have two nieces in Wollongong. One day I will visit Australia too. Since the time I was a kid I wanted to walk around Roman ruins. There was something magical about all those columns. It was a desire fuelled even more when, for a year at high school, we studied Roman art and architecture and columns and plinths, capitals and inscriptions in detail. A year of Ancient (Roman and Greek) history at university kept the interest alive. And in their own quaint way the pictures of Asterisk and Obelisk continued to pique the fascination. Fortuitously I arrived back on a day with all the offices shut and a few hours of sunlight left. I grabbed a taxi driver (so to speak) and directed him to Jerash. No side trips to souvenir shops run by a distant cousin. To Jerash only. No, it’s not too late in the day. Heaps of time. Less talking more driving. Jerash is a well preserved and partially restored Roman city on the outskirts of Amman. I happily wandered its streets for hours (and the driver seemed content to wait which was very decent of him). 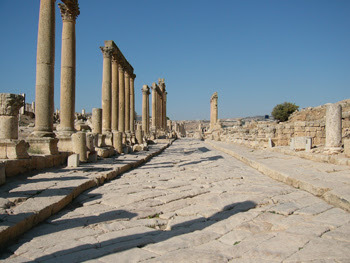 Here are the wide colonnaded streets, pavement still cut by chariot and wagon wheels. Here too the little lanes into roofless houses in high density apartment dwelling we would be very comfortable with. Cellars. Temples. Fountains. A hippodrome. Two amphitheatres still in working order and used for performances today. Shopping centres. Churches. An earthquake in 790 AD pretty much ended this city – all those blocks of stone resting on columns must suddenly have looked like a liability when the earth started moving. 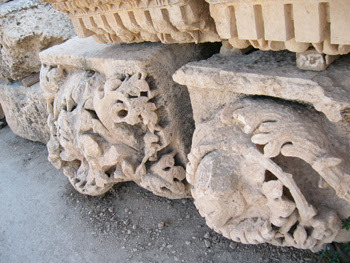 But there are other durable pieces of stone work that can only be admired for their creativity and ingenuity. With some of the buildings stripped down you could see how they hung ceilings and floors two or three stories high – with a lot of cantilevering. There is a remarkable dedication in stone to the nymphs, a collection of fountains placed in a wall, fed by water down two kilometres of piping. The piping has gone, the fountains remain. Even the way the stone was dressed was mimicked in Victorian stone masonry 1500 or more years later and you can see the same style of work in London, Sydney, Philadelphia (which incidentally used to be the name by which Amman went by). Those cut pavers, the apartments with their cellars and an old well hint at real people walking around this place. They have an eerie presence still. Most poignant were the fallen stone decorations, on which you can still see the chisel marks of the masons. Nearly 2000 years dead yet his handiwork is still visible. As I was caught by the sight of it lying in the dust of centuries I thought of our yearning for immortality – a universal desire across all time to be able to spend all time crafting what we can do best. How disappointed that mason would be to see his work thrown down like this. Or would he be happy to know we are thinking of him? Happier still no doubt if he was still plying his craft. Thought I would share a touching moment. On my first night here a young man dressed snappily in the hotel issue waist coat appeared at my door to turn down my bed. (Can someone tell what that is all about – after being on the road for more than 20 years I still don’t get that. A hangover from older days and colder parts when hot brick was put in your bed perhaps?) Anyway, in he came and fussed around a bit and then we found ourselves in conversation. And so its been every evening since. Last night he discovered this was my last night here in his hotel and he was disappointed that we would no longer have our broken English conversations, a laugh and a backslap. (I said slap!). Plus the few high fives thrown in. Heavens knows what they were about but they meant something to him and communication is, after all, more than words. Tonight he was waiting for me as I came in from meetings. He expressed his sadness that this was my last night here, sadness at my next destination (!) 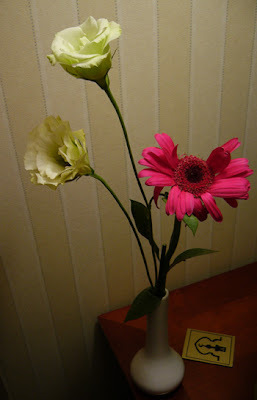 and as a token of his friendship presented me with this rather battered looking gerbera (the other flowers were standard issue to every room). He had stiffened it with wire and from what I had gathered he had made a special effort to get his hands on it. Which means he probably had to sneak it out of the monstrous displays down in the lobby. Flowers from blokes is not normally something that rings true in my own culture but this meant something special to this young chap and after carefully getting the stem trimmed, and placed in water, another high five and a “sad to be goodbye” he was gone. Who couldn’t be touched by that? One of those moments that makes travelling in other cultures extra special. And which was a sign of the hospitality that is a genetic component of the Arab makeup. Well part of it anyway. This composite view looks down the mountain and across the Jordan Valley. Views to the right complete the picture in terms of understanding the terrain but given the camera flattens everything and depth is lost I have left it out. This gives some idea at least, and the general direction of things. Despite the dust and sand blowing up out of the desert we could just make out the Dead Sea, which turned out to be about a 15 minute drive away. The general direction of other points of interest are shown. Bethlehem and Jerusalem could not be seen but are only 50km away. The hills on which they sit were faintly visible but I had to wait until we reached the bottom of this escarpment before they became really clear. And an escarpment it truly is. Standing here gives you a good sense of why Joshua attacked from this direction. Surprisingly, despite the tough terrain, the whacking heat and the strong winds the hills are dotted with the tents of the Bedouin who live out here on…, well, I am not too sure. Did not seem very much around although each storm torn gully (the evidence of violent flooding is everywhere) had a base of vegetation tucked away from the elements.